We all know what it feels like to have too many options: a sense of being overwhelmed, of being spoilt for choice, of something like being paralyzed by all the possibilities. Too much choice can be demotivating – where do you start, how do you decide?! When we don’t really know what we want, then selection can become more complicated and time-consuming. Paradox or paradise of choice? For some people, the seemingly infinite number of options triggers something called infobesity. They become almost desperate in their search for information, scouring the Internet obsessively, worried that they might miss some essential piece of information. Having too many options can force people into making hasty decisions – ‘I just want to get it over with!’ – or freezing and not being able to decide anything at all. I once heard Barry Schwartz, leading psychologist, describe how people feel more stressed if they are presented with too many choices. Disengaged buyers are the result. Schultz explained that this paradox of choice in fact reduces consumer satisfaction. On the other hand former editor of Wired magazine, Chris Anderson, has challenged this idea, stating that this phenomenon of overwhelmed-and-disengaged consumers is confined to the physical world. In Anderson’s mind, the virtually endless range of options online represents a paradise of choice. Ultimately, onlife consumers want the best of both worlds, which is finding their own perfect match in the real of infinite possibilities. They feel confident that smart navigation technology and algorithms will present them with offers that fit their personal wish list down to a T. The simplicity of choosing from ten options does make them happier, though, than selecting from 150 possibilities. There are four basic ways to select goods and services: by rote, by comparison, through research and on impulse. The first one is how we choose many of our routine choices. We balk at the very idea of even ten options, because we simply want the same item as before, or at a stretch, a variation on a theme (a larger carton of milk, a new flavor yoghurt). This kind of routine choice is usually made at the supermarket or local store. We have no need for (online) orientation whatsoever, we just buy what we always do. The smart economy can help us do this, with tech making sure we can complete our purchases smoothly and swiftly. Supermarkets can store our purchases and line up a shopping list for us beforehand. Online daily purchases may make up but a small chunk of the total money spent online, we should expect to see an online grocery shopping boom in the very near future. McKinsey has stated that consumers certainly don’t lack interest in this type of shopping, the perfect conditions just haven’t been created yet. The time is now. The supermarket business can’t afford to sit back for another second. 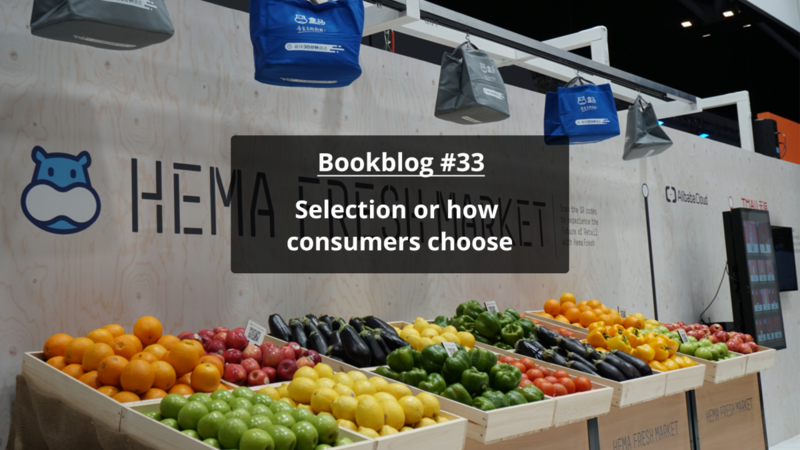 Next week, I will look at other ways of selection, in order to paint a full picture of consumer behaviour in this stage of the customer journey. This is blog 33, based on my book ‘The end of online shopping. The future of retail in an always connected world’, published by Business Contact (Dutch/Flemish editions), Nubiz (English edition for UK and US, and Danish editions), WSCP Singapore (English edition for SE Asia), Post & Telecom Publishers Beijing (Chinese edition), Hoepli (Italian edition). The book will be published in Korean in December 2018 and is being translated in German, to be published in spring 2019. Additional translations are in preparation for 2019.